Nishiki only produced racing bicycles of very high quality for a relatively short period of time; this Competition is one of them. This Nishiki Competition is one of the last models with a frame hand-build by the Kawamura Cycle Co. in Kobe, Japan (*). The size of the frame is 58.5 cm and it’s build according to professional race geometry. Weight of the complete bicycle is only 9.8 kg. A beautiful example of a racing bicycle which indicates very well were Batavus was up to in the beginning of the eighties, the Competition. 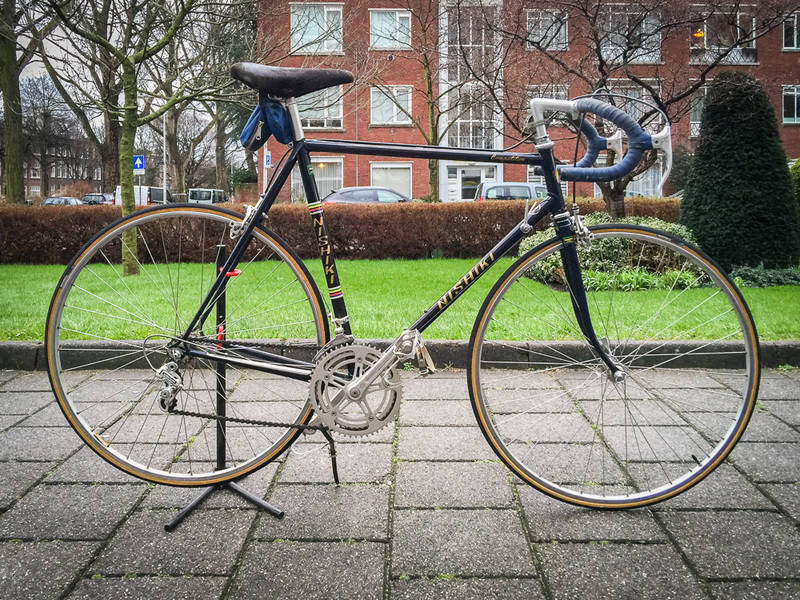 This Batavus Competition was a good competitor of several high-end racing bicycles like the Koga-Miyata’s at that time (Andries Gaastra founder and owner of Koga being the former CEO of Batavus), and was for instance as well fitted completely with the beautiful Shimano 600 Arabesque equipment. A very impressive full carbon, honey comb structure Y-frame, full suspension mountain bike. In fact only the frame of the standard Trek Y-11 has been used. For the rest the bike is fully upgraded with Fox front and rear (Vanilla) suspension, a Chris King NoThreadSet head set and completely 21 gear Shimano XTR shifted. This posting is about a Giant model Peloton Lite which was produced in 1985. It is one of the first racing bicycles which Giant supplied in The Netherlands. Giant started to sell racing bicycles (through Koga) in 1985; the frame of this bicycle was built at Giant in August 1984.